Instructor Wayne Manthey returns by popular demand to teach a day-long drum-making workshop at Crossings. Cost: $135 small drum (13-inch), $155 large drum (16-inch). Using a cedar frame and deer hide, you will create your own handmade, single-sided drum. What you will walk away with is more than just a drum. Wayne Manthey will take you on a journey to create a very special instrument using ancient techniques. To personalize your drum a little more, there's an option to add a stone to the back handle. This is a palm size or smaller stone or item of ANY significance to YOU. Making personal frame drums is a journey that is individually and spiritually meaningful. 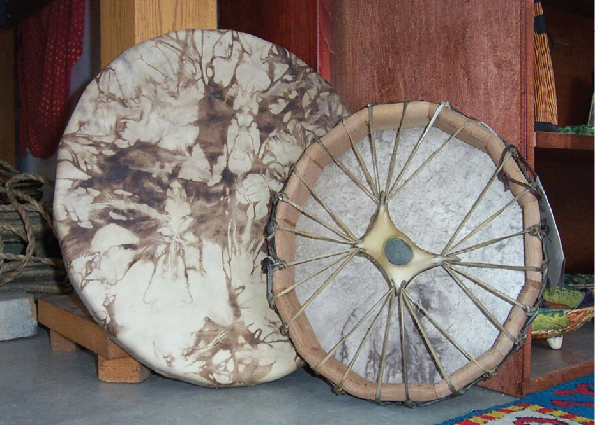 Instructor Wayne Manthey is returning to Crossings to teach a daylong drum-making workshop at Crossings on Saturday, Aug 3, from 11:00 a.m. to 4:00 p.m. Here's what Wayne says: "The healing properties of a drum are found in the elements that make it: wood and animal hide. Making personal frame drums is a journey that is individually and spiritually meaningful. Teaching drum making classes involves storytelling and introspection. The drum symbolizes the heartbeat of life, the heartbeat of community. It is not simply an art form, but a tool for cleansing, centering and focusing one’s intentions for health and happiness." Tying up the leather and dipping it into black walnut dye is fun...but pulling it out to see what images are revealed on your drum is incredible. Everyone's drum is so different! In his early experiences with drumming, Wayne was moved by the healing sound drums produce - a deep, rich reverberation that generated a feeling of physical and emotional well-being. He searched for a drum that would have this special sound, but when he was unable to find exactly what he wanted, he decided to make his own. In the process, he discovered that the act of making the drum was profoundly healing. Since then he has guided hundreds of others through the process of making their own personal drums.